Eighty percent of job openings are never advertised. It is essential to create an online personal brand and a personal website acts as its centerpiece. Requires self-promotion. You have to “put yourself out there”. Many people shy away from making themselves a “personal brand”, and the advertising that goes along with it. No pre-defined standard structure or layout. Developing a personal website is more sophisticated than a simple resume – something that has a very rigid format. Dealing with personal and professional representations. With a personal website, you want to infuse aspects of your personality (which requires stepping out of the professional confines of a resume). The content you include on your personal website should take advantage of a web interface (and Ms. Smith lists each element). This is an opportunity to share all types of media – video, images, files, hyperlinks, and rich-text – to promote your personal brand and add new dimensions to a basic resume. Most potential employers will review your personal website; moreover, many of them think it is a strong branding tool. Last year, I conducted a survey and it was clear that a personal website can be a strong part of an employment evaluation. I think a personal website replaces the resume as an employment evaluation platform. 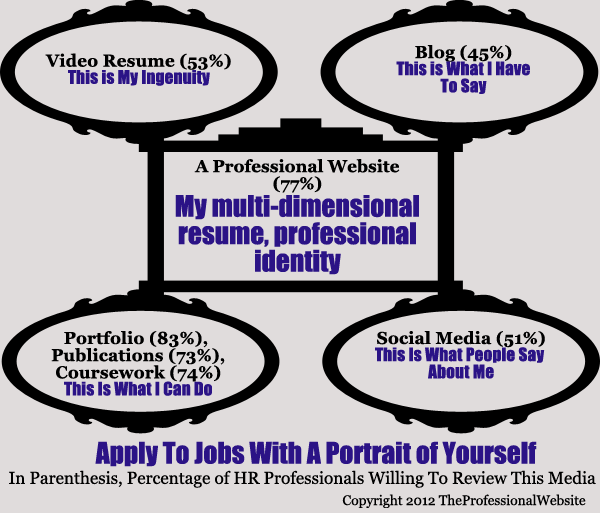 I sometimes refer to a personal website as a multi-dimensional resume for this reason. So to add to what Ms. Smith says in her article, I think you should include enough content on your personal website so that it is not necessary to refer back to a resume (when you are actively or passively seeking employment). I understand that some potential employers are going to want to see a resume, so you might include a link to a resume from your personal website – though the way I designed a personal website, the content from my personal website feeds a PDF resume – so there is no duplication of content. A personal website is an opportunity to apply a “pull approach” – where you lure recruiters and potential employers to your personal website. As discussed in my last blog, you can use Google, Twitter, LinkedIn, Facebook, and MonsterJobs to get recruiters to your website. You can also blog and participate in other blogs and forums to promote your personal brand. I think a “pull approach” is a more efficient and effective way to place employment. Ms. Smith tiptoes around this in her article, but I think employing a “pull approach” is a compelling reason to have a personal website for active and passive job seekers.